Since I didn’t really had any historical UFOs worth finishing for the HSF challenge nr 8 – UFO (Un Finsihed Object), I decided to make a UFI (Un Finished Idea) instead. 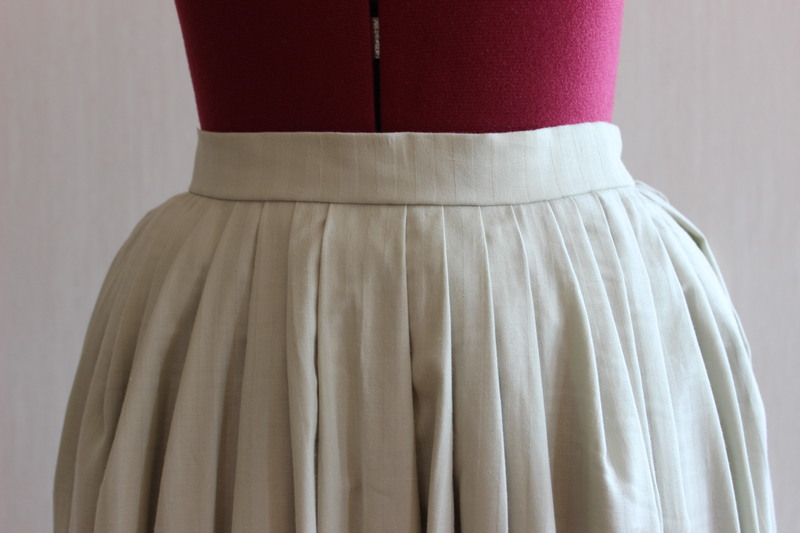 And something I’ve been thinking about, but not had had the time to make, was a matching skirt to my sisters “new” Pink Caraco jacket. 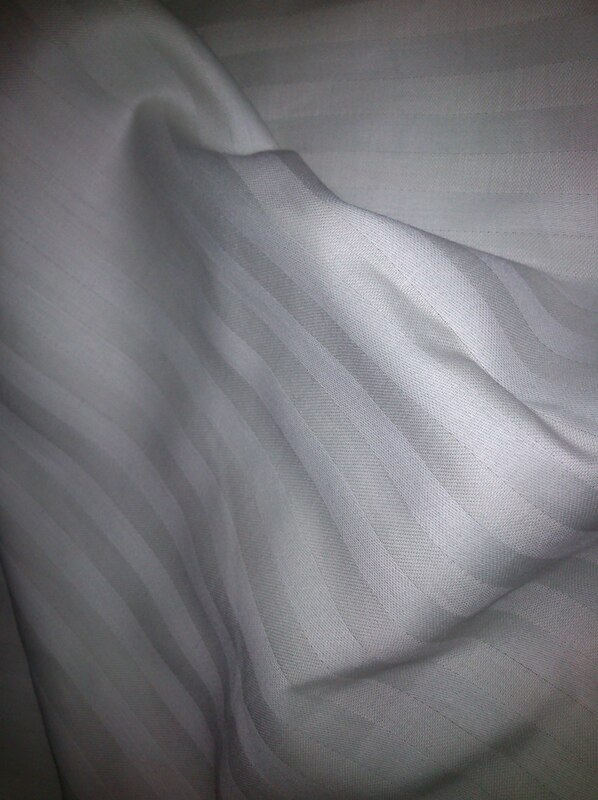 So I brought out the newly re-dicovered light pistage coloured cotton, leftover from my Regency striped gown. I’ve had quite a lot of fabric left (and still do after this project) and it looked so nice together with the soft pink colour of the jacket. So there was really no discussion on what to make of it. 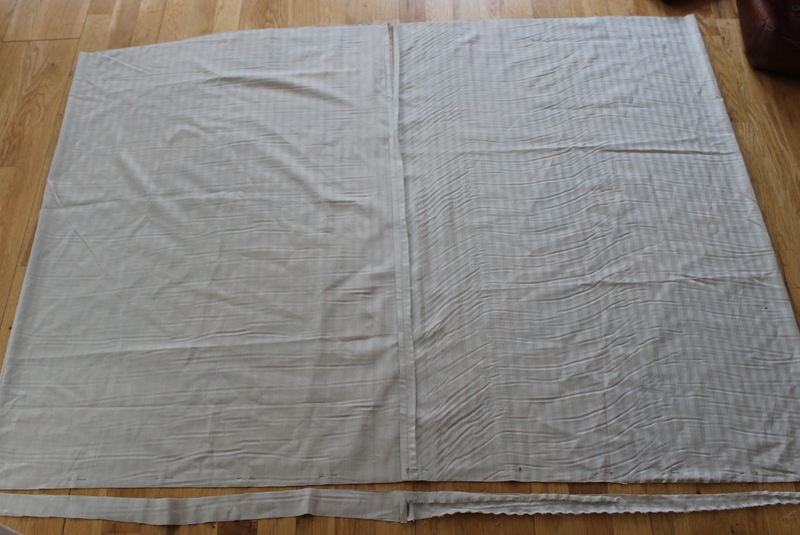 I started by cutting two lenghts of fabric (using the whole width), shaping the top a bit to fit over a bumpad. 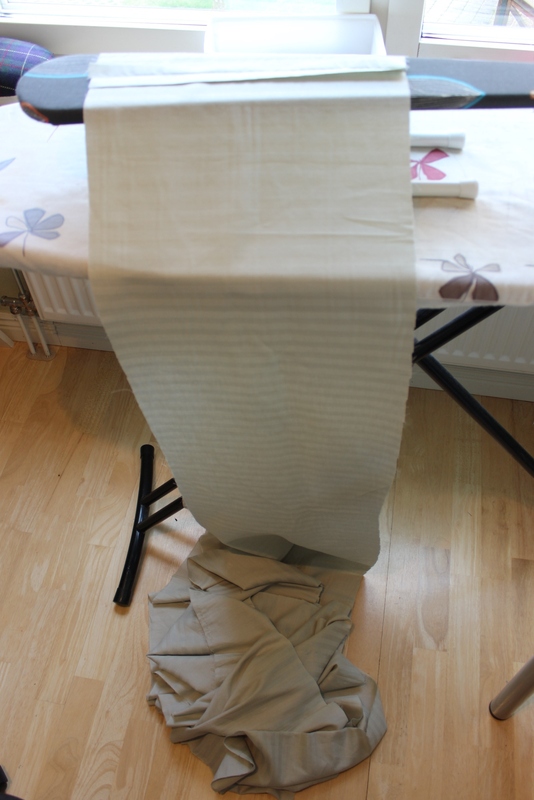 Then I sewed them together, leaving 20 cm at the top un-stitched, and cut and hemed it to the right lenght. 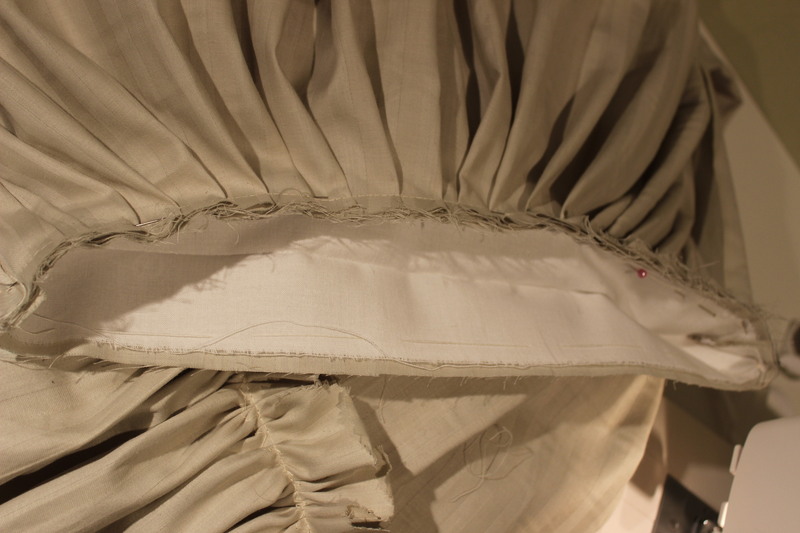 Then I used 6 withs of fabric, each 30cm broad, to make a ruffle. 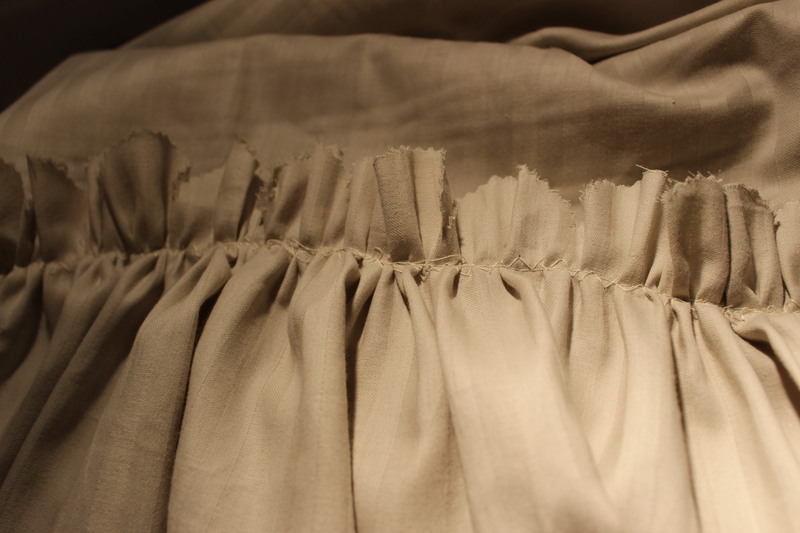 I sewed the together to a continious piece, and bede sure every piece was the same size. 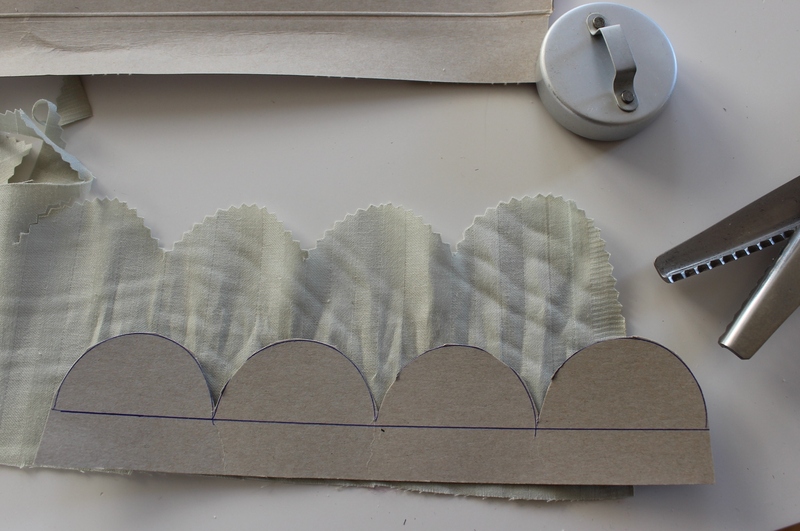 I wanted to try something new on this ruffle, and drew round shapes on some cardboard to use as stencils when cutting/hemming the ruffle. Smal one for the top, and larger one for the bottom line. 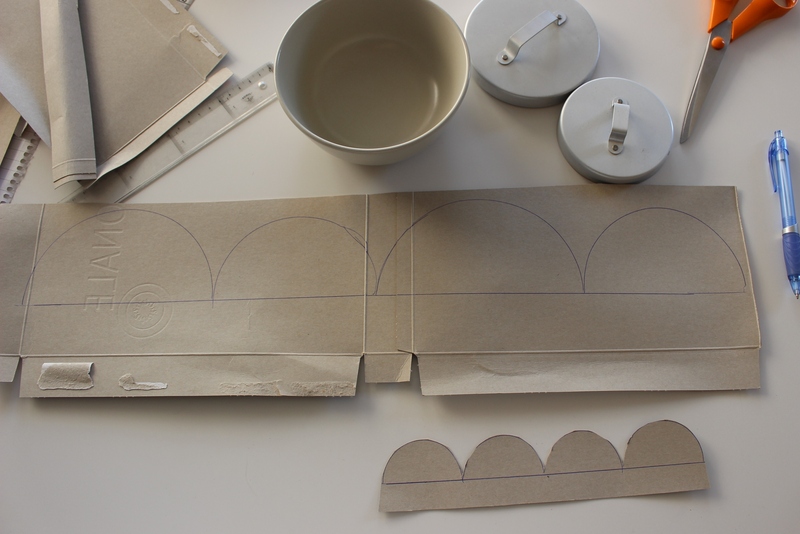 Making a test piece, using some scrap fabric and a rick-rack scissors. 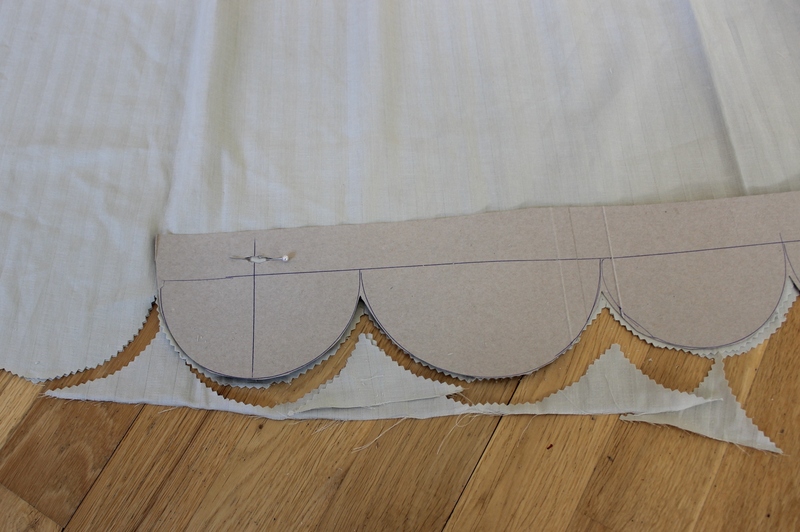 Once I’ve finished the stencils I started to cut the edges of the ruffle. It was a long and tedious work and I emedetly regretted the idea. Then I stitched on a gathering thread, close to the smaler scalopes. 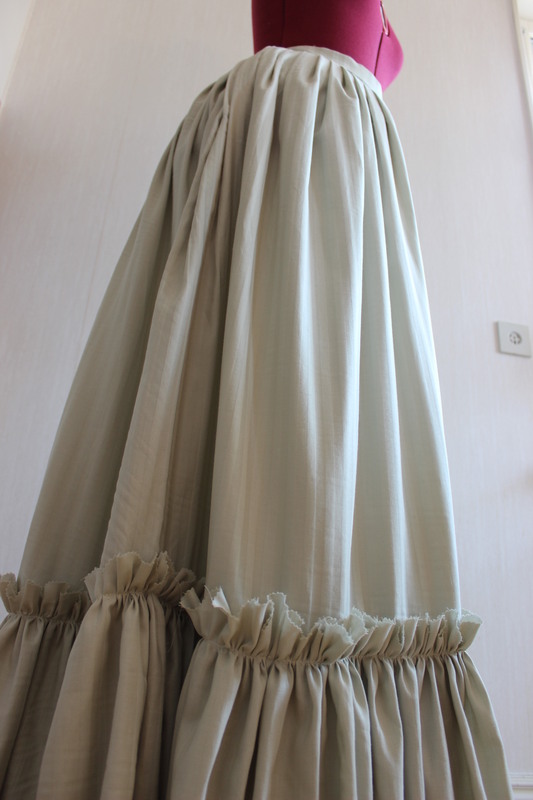 Gathered, pinned and sewed the ruffle to the skirt. 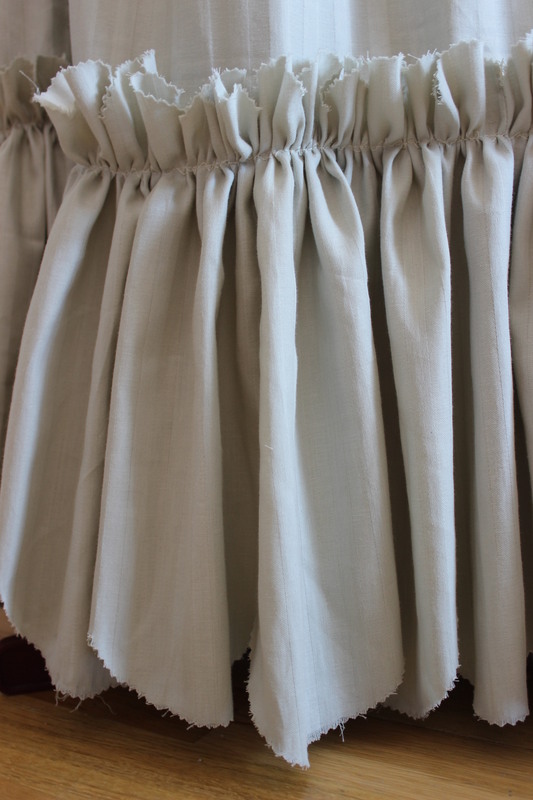 I placed the ruffle so to make the lower scaloped edge overlap the skirts hem by a few cm. Then it was time for the wasitband. 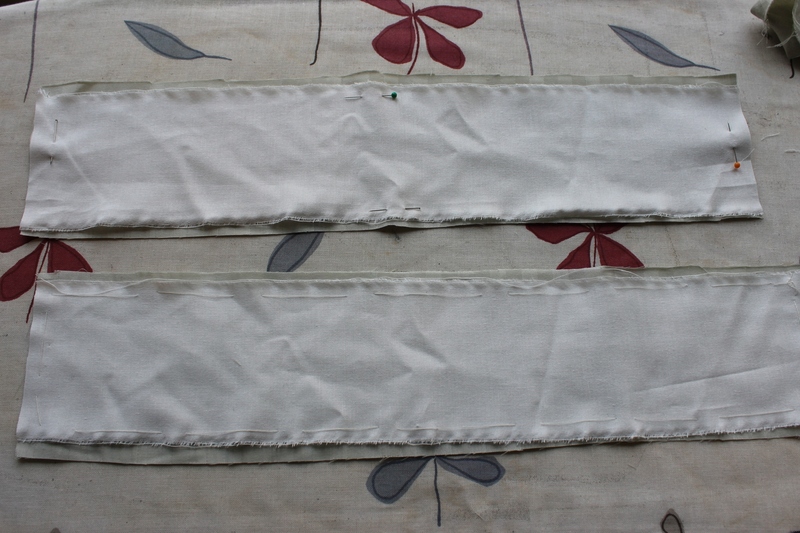 I cut two pieces each half the wasit measurment, and basted on some interlining. 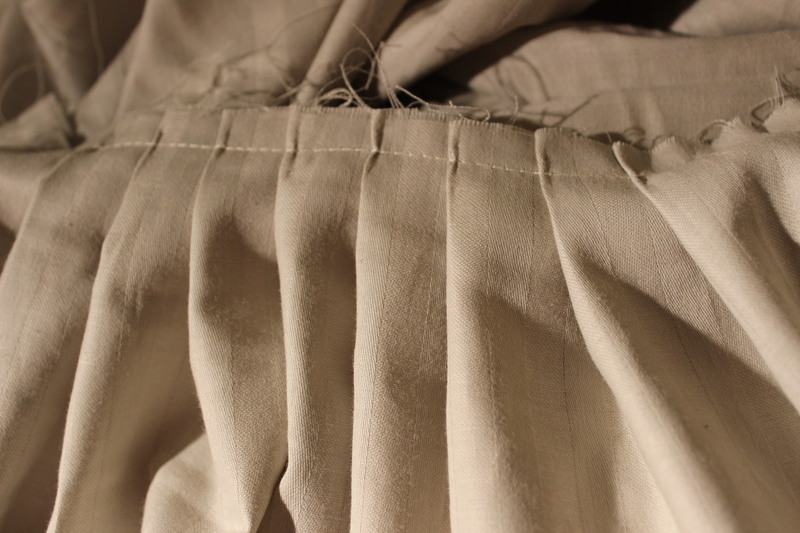 Then I folded the pieces, putt some cotton cords between, and stiched them together at the ends. Two halves makes a whole wasitband. 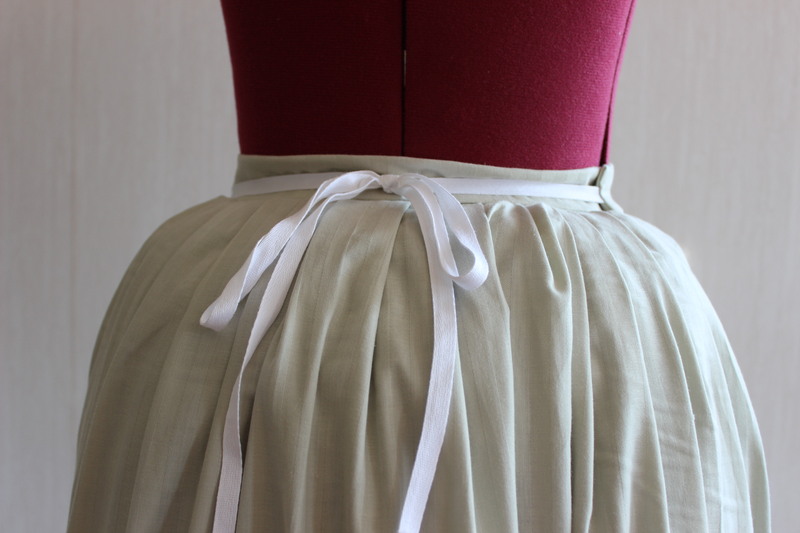 I then measured and pinned the pleats in the skirt to mach the front and back waistband. 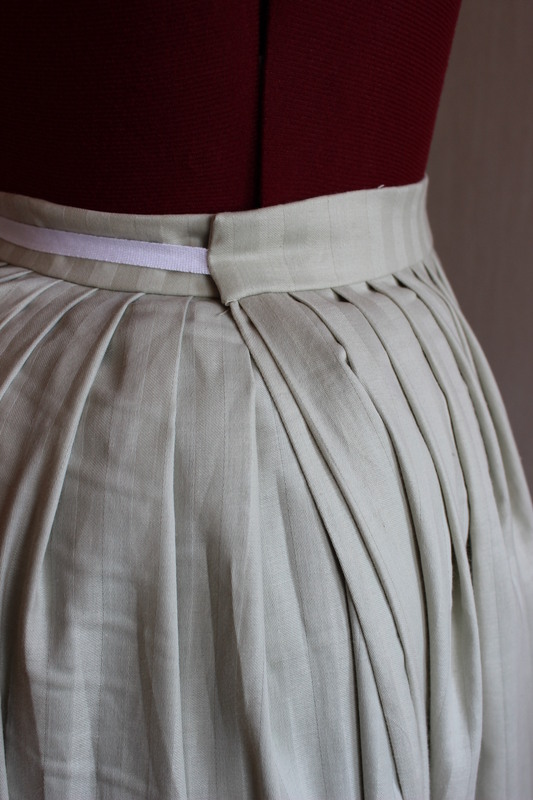 I basted the pleats in place. And pined on the wasitband. 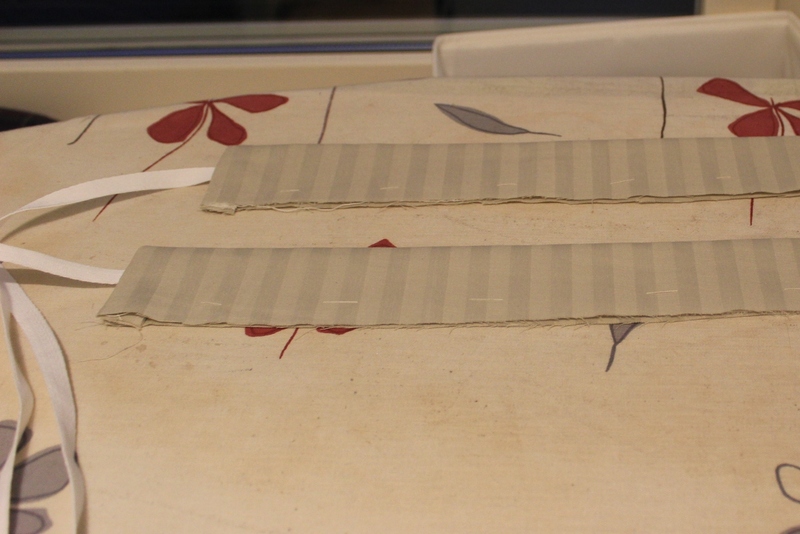 Then I folded the back of the band under and hand tacked it in place. 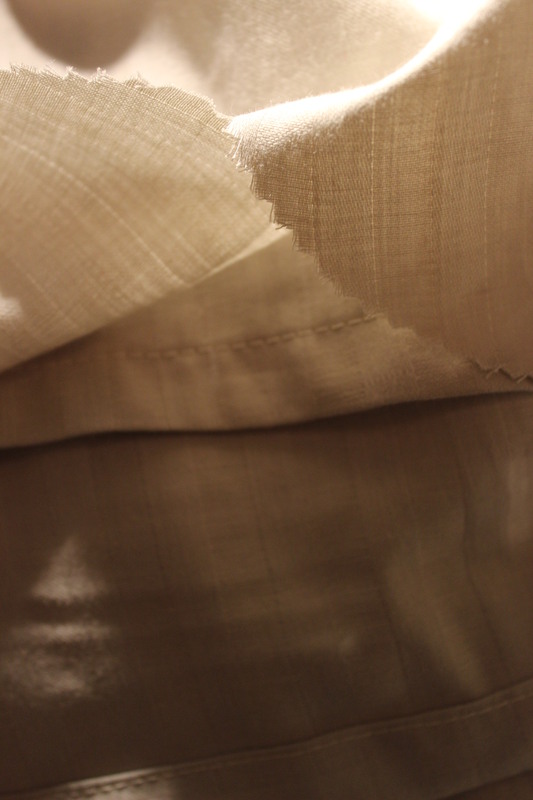 Fabric: 3 m of soft pistage coloured cotton, and scraps of white cotton for interlining. 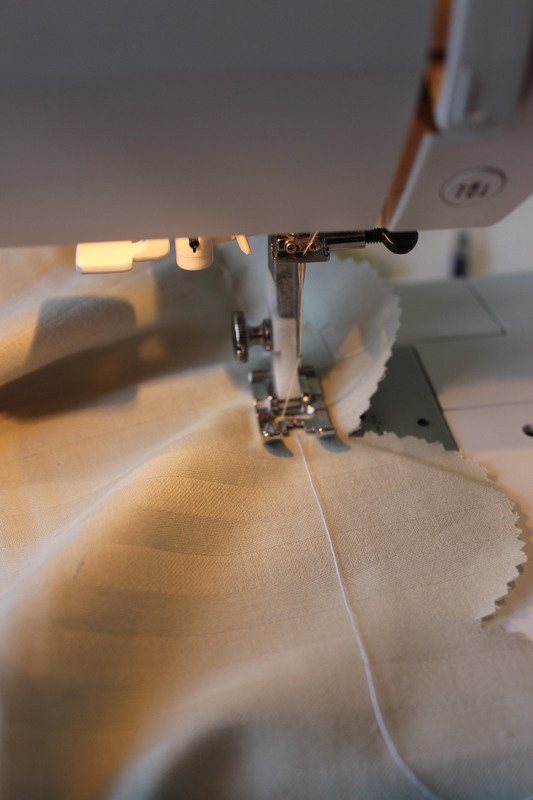 Notions: Thread, 2 m of cotton cord. How historical accurate: So so. I think the shape and colour is good. 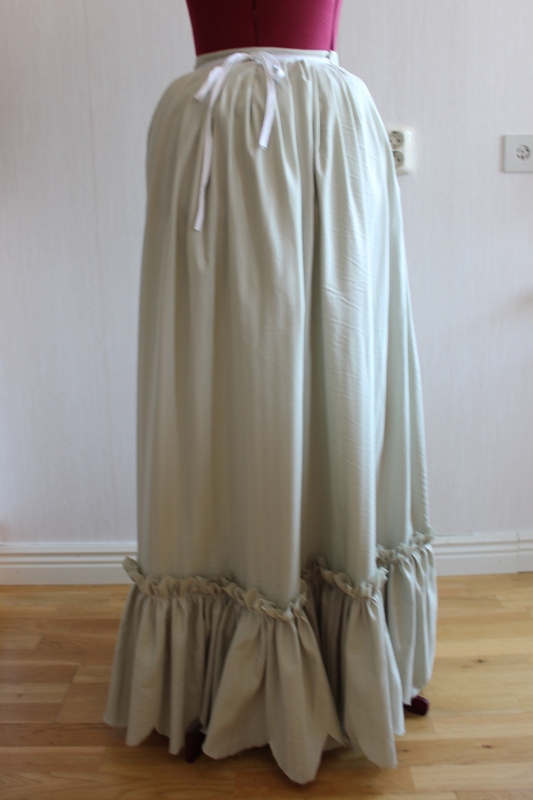 But it is compleatly machine made, and cotton was not really used for this kind of skirts untill a bit later. Time: Much more then I care to admit. 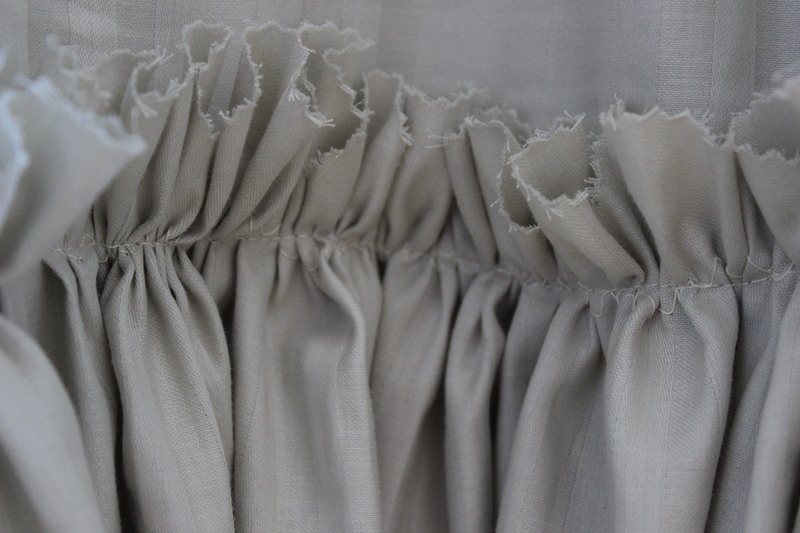 If not for the scaloping on the ruffle, 3 hours, but all and all about 6 hours. First worn: On easten for photos (pictures from the shoot will be in my next post). Final thoughts: Both me and my sister like it a lot. It is pretty, soft and moves nicely when she moves. 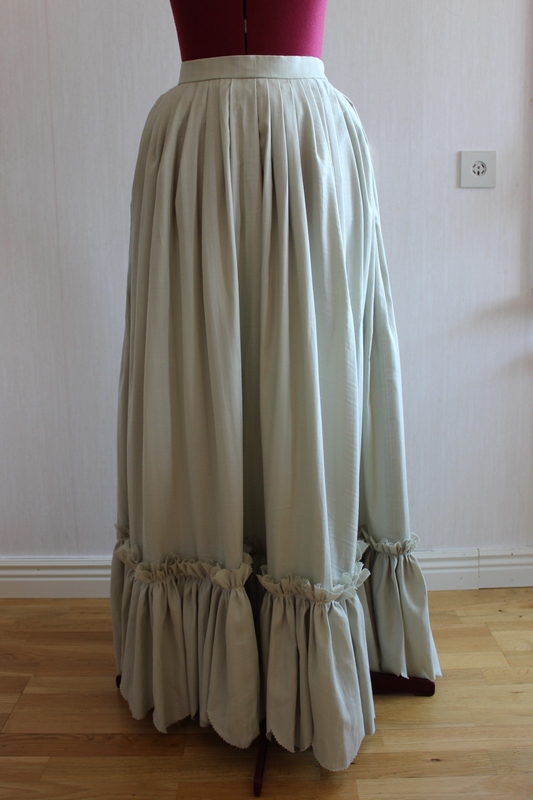 I will have to make it shorter though – about 10 cm, to make it more of a walking skirt then the evening lenght it curently have. But once that finished I’m sure it will look really lovely and summery.